Ashot Shirazyan comes from Armenia on the edge of the old Soviet Union. His wife Irina grew up on the Volga River in the heart of Russia. When I walk into A & A International Foods on Sardis Road I think of my Dad. He was a college professor who taught Russian history — with a strong belief that food was part of the story. Nothing delighted him more than finding a European deli or a baker of fresh crusty bread. We wouldn’t wait to get home but would tear into the bags and parcels for a spontaneous picnic. He’d love A & A International. 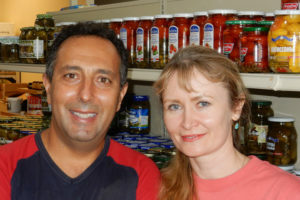 Ashot Shirazyan started in 1994 on Independence Boulevard, then in 2016 he and wife Irina moved to a spotless space hidden behind a McDonalds at the corner of Monroe Road. They feature not just foods of Russia but also of most countries inside and around the old Soviet Union. The sales staff, dressed in crisp green uniforms, will happily hand you thin-sliced samples. So let’s assemble a picnic. 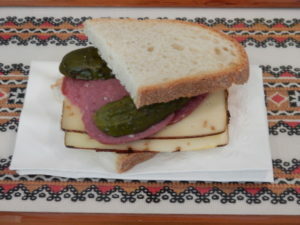 Ask for a sample of the Russian style beef salami called Jewish Cervelat. It’s thick-sliced, plump and moist in its casing, pungent with garlic. Or try a sliver of a hard salami, perhaps the pork one named Moscow. It’s dryer, ruby-red, with a wrinkled exterior that indicates lengthy curing. 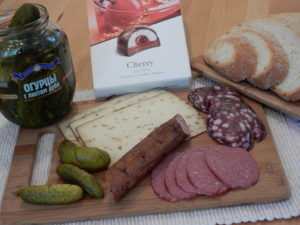 My favorite discovery is Kielbasa Domova from Poland. 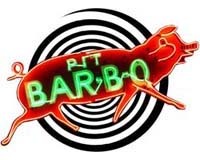 The slender foot long casing is dark with smoke, stuffed with soft chunks of smoky pork. A whole sausage will set you back barely five dollars. Russian cheeses seem to be mostly mild, quietly complementing the assertive sausages. I like one called Greenwald that’s embedded with tiny bits of walnut. A & A sells fresh bread, ready-sliced for sandwich-making, baked by Serbian-owned Nova Bakery on Central Avenue. 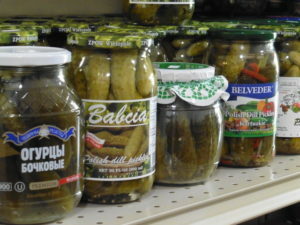 You can tell that pickles are a Russian mainstay because A & A carries 34 varieties. Buy a jar, pluck out a couple for your picnic, take the rest home. After polishing off a sandwich or two you’ll want dessert, right? Select an eye-catching box of cherry filled Bonjour chocolates from Ukraine. Or a Stradiva ice cream sandwich from Lithuania.